The international development arena has been transformed in the last two decades. On the one hand, NGOs have become more market oriented, both in terms of their business models and in terms of their approach. On the other hand, private actors have also become more socially engaged, and advances in technology and communications have brought new opportunities for market sector actors to create social impacts. 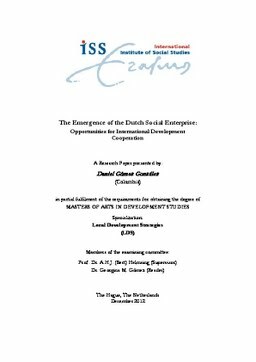 The result has been an increasing trend of social enterprises (SEs), hybrid organisations created for a social purpose but participating actively in the market for their subsistence. This paper examines the differences between traditional NGOs, funded mainly by government grants and donations, and these new actors that rely primarily on market-based income. Furthermore, this study tries to examine how Dutch NGOs and SEs are creating links between activities focused on market building and actual participation in markets, a challenge that Helmsing and Knorringa identified in 2008. To do this, 21 SEs were interviewed and another 16 NGOs were studied on the basis of interviews (5) and their annual reports, strategy papers and official websites. We find that there are three ways in which NGOs and SEs are successfully “bridging the gap” between market building and market participation: i) through official partnerships, ii) individually by tapping market and non-market sources of funding, using new technologies and leveraging from new forms of private philanthropy, and iii) by selling specialized “market building” services that guarantee an active participation of the private sector. Furthermore, the ability of SEs to engage in market building activities and of NGOs to participate in the market depends largely on their origins and the business models and financial strategies that they adopt.